I have a confession to make. I watched Gardeners’ World on Friday night and really enjoyed it, possibly an age thing or maybe just all this good weather. In truth, it is probably the product having spent a week in my partner’s back garden attempting to level it. For a week now, we’ve been raking and shovelling all sorts out of rubble and rubbish out in the vain hope of a pristine green lawn one day. There’s not a bone in my body that doesn’t ache or twinge right now. However it’s also been a hugely enjoyable and reflective time. Time to breathe in fresh air and think. With Brexit now postponed until October 31, perhaps this is what the country’s 650 MPs should do. 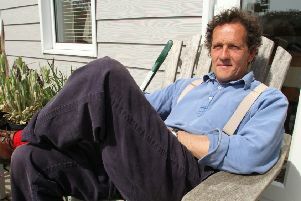 Stop, breathe and think, or put Monty Don in charge of Brexit. I’ve heard worse ideas if I’m honest! What we have now is time. Time that European Council President Donald Tusk warns us we should not waste. Yet everyone’s idea of how to spend it differs. Should it be used to hammer out a deal that Parliament can support? To organise a public vote? Alternatively, even time to hold a second Scottish independence referendum? Nicola Sturgeon has long promised an update on her Indyref2 plans and has delayed her big intervention more times than the PM has lost votes. Now there is a six-month window. That’s long enough for a snap referendum if she rolls the dice now. It must be tempting. Will there be a more opportune moment in her lifetime to call it than now? A killer combo of a weak Tory government, Brexit chaos, little focus on her government’s mounting domestic tribulations and ahead of the Salmond trial beginning? A gambler would surely play their hand. Of course it’s not that simple. Sturgeon would need a Section 30 order from the UK Government to hold a referendum and the Prime Minister has ruled that out. However, Theresa May is only that in name now. Meanwhile other MPs, including notable Cabinet Ministers and leading opposition members are focusing on finding a deal that can command the support of the House of Commons. A cynic might suggest that’s what they should have been doing for the past three years, not just the last three weeks. Any deal will require compromise. Labour says it cannot back a bad deal or no deal, insisting instead on the pursuit of a “good deal”. If such a thing exists of course, given all evidence shows us leaving the EU in whatever form will cause significant economic decline. Labour demands that good deal must include a customs union, the benefits of the single market but an end to the free movement of people that hinges upon. The Tories bitterly oppose many of these demands. So, far from negotiating or compromising, those at the table are drinking tea and trying not to blink first, knowing by giving way on their own positions, they’ll face mutiny on their back benches. It’s increasingly likely that we’ll participate in the EU elections next month. I savour every day I retain my EU citizenship, but I’m not sure I welcome an election which is so exposed to being hijacked by the far right. Tommy Robinson MEP is a real possibility. I can see Brexiteers congregating together under one banner, whilst Remainers offers 57 varieties, splitting that vote even further. Those who want to stay in the EU could really do with one baggage-free political force to unite behind. Those who fear a second EU referendum because it would be a nasty and divisive might get a campaign like that regardless. Whilst digging and raking, I’ve been throwing this around in my head on repeat. These are tumultuous times, which will define UK politics for generations. Those looking for green shoots have a lot of back breaking hard graft ahead of them yet.